Thirty years from now, Earth is in bad shape. It’s heavily polluted and dangerous and may not last much longer. The Robinsons are tested and cleared to leave for a space colony and brighter future, but after John and Maureen Robinson and their children Judy, Penny and Will set off they crash land in an icy alien planet. Together they begin the task of recovery and renewal, a difficult path full of traps. Like pioneers of the Old West, the Robinsons relearn living in a strange place. 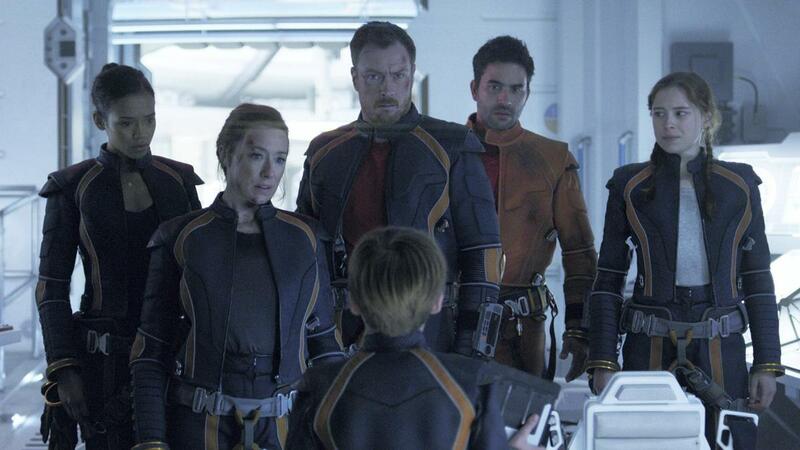 Netflix’ new version of Lost in Space is a triumph, great writing and ideas, new complexity, and terrific performances. It goes light years beyond the 60’s pop TV hit, modernised to reflect the way we are today and what we aspire to be. It stars Toby Stephens, Taylor Russell, Mina Sundwall, Max Jenkins and the inimitable Molly Parker as mother and scientist Maureen Robinson. We spoke with Parker in Toronto. There are so many different ideas at play in Lost in Space, one being the proliferation of space junk. We wreck one planet and move on to the next. It’s something to think about. The original in the 1960’s, this idea of going to space was this great idea, this fantasy and our show rooted in some reality that everyone can relate to. Kids who are growing up in this world today are fully aware that the polar caps are melting and polar bears are dying and on and on. We are not just going to be able to go out there and do it again. The show’s based on equality. One of my fave moments is Maureen saying “that voice (that has the power) is mine” and she is unchallenged. We look forward to a future where equality is the rule. It’s remarkable in talking about this that it is still a thing. One of the things I really love about the show, in that it takes place 30 years in the future, no one ever talks about in the show, it’s just assumed that whatever job a man could do a woman could do if she was talented enough and had the resources. I love that about the show. I also love that the children are educated and enlightened, in medicine, engineering and solving problems. If I was a kid watching this I would want to be like this.So you’re stranded out in space with your soon-to-be ex-husband. How does that complicate things? One of the things I love about this show is that the romance is about the parents. So many of our families look like some version of this now, blended families, in flux and a lot of kids can relate to that and certainly parents. It’s not what they expected, they didn’t expect to get lost, they would find a place and co-parent together as many of us do and here they are. They seem to have reached a peak of awareness and reaching that ideal in a really encouraging way. This show is a really wonderful combination of massive spectacular adventure and a family drama about a family that is relatable. They’re flawed, they’re not perfect people. It is quite aspirational. Because it’s not a dark show, it’s exciting and scary and the stakes are high, but it’s not gritty. You’re talking about the show’s look, the effects, and that it’s so natural looking. Was there much green screen? Surprisingly a lot of it is practical; there are these layers of special and visual effects. I had assumed being sci fi there would be tonnes of green screen. We were out on location in the mountains overlooking Howe Sound and the elements – it gives the show a cinematic look, these special effects which took many, many months. We stopped shooting nine months ago, there was as much to do in post-production as there was in shooting, and then they layered it all together. It is really cool. There were things you couldn’t see on the set, the robot for instance, so there were practical and post visual effects. It appeals to all-ages in ways that are truthful. That doesn’t happen much in mainstream entertainment. That’s really hard to do, it’s a tone and we talked about it all the time, the writers really walked the line on this and it was really something the actors who played husband Tobey Stevens discussed a lot. How do we make this couple a real couple with real problems without getting into the nitty gritty details of who did what to who, and it’s not like a bickering petty couple, there is deep hurt here but they have really loved each other. So there is heartbreak. We get to have all of that. And Will’s relationship to the robot and how complex it is in mirroring his father who has been absent. I didn’t watch the original Lost in Space, but my impression is that it was a bit cheesy and camp. It was for kids, or everyone I know now who saw it was really into it as a kid, it was must see TV if you were ten. This show occupies a broader space than that because audiences are so much more sophisticated. My greatest fear is one day I’ll be forced to go into space. How do you feel about it? No. I’m not going. I don’t even like to fly. I don’t want to go to space, I love it here. It’s a miracle that this place exists. If anything this show illuminates the true cost of what leaving this planet would be.